We will need 72hrs or 3 days advance notice of cancellation, otherwise the first night of booking will be charged to customer's credit card. There will be a Refundable Key deposit of SGD20 per key upon arrival. Full amount due must be paid in SGD via bank transfer minimum 2 weeks before arrival. All online and email group bookings will be charged all beds in the dormitories or private room even if there are less number of guests than the maximum capacity of the dormitory or room. For group bookings above 20 pax, kindly email us directly at booking@footprintshostel.com.sg for a quotation. Footprints Hostel is able to accommodate up to a maximum capacity of 170 pax. Only 10 beds will be available each day (Sunday-Thur) for the Early Birdy Special. After the 10 beds have all been taken up, normal rates will apply. We have been voted as the Most Popular Hostel in Singapore in the 2014 and 2012 Hoscar Awards and are definitely one of the most visited backpacker hostels in our city. 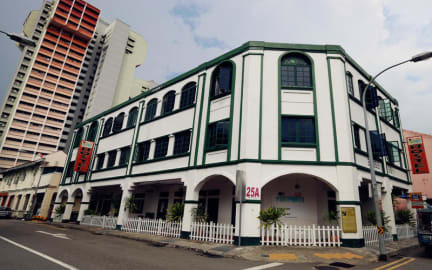 Footprints Backpacker Hostel is well located in the heart of the culturally rich Little India District with a maximum capacity of 170 pax. You will be staying right at one of Singapore's main ethnic attractions, with convenient access to many other attractions and the city. Why choose Footprints Backpacker Hostel as your choice hostel in Singapore? We are located a short 5 minute walk from Jalan Besar MRT Station and Rochor MRT Station (Metro/Subway/Tube), which is the most cost-effective way to get around Singapore. We are situated at a premium location which is convenient to walk to anywhere. We know how backpackers love to walk everywhere. As you are leaving your footprints around our little island, we too hope to leave some in your memories of your stay in Footprints, your home away from home. - We only accept cash payment in SGD. - There's a SGD20 refundable key deposit upon check-in.This fee will be refunded to you upon an incident-free check-out. - We do not allow children 16 years and below to stay in our dormitories. - Children below 16 should be accompanied by an adult. If you have young children traveling with you, please call or email to inform us first. - All promotional beds/deals are only valid for new guests who have not stayed with Footprints Hostel in the past 3 months. - All specials/promotional beds/deals are not applicable to walk-in guests and existing guests who are extending their stay. - Specials and promotional beds are non-refundable. Full payment of booking applies in cancellations, no shows and early check out. - Online group bookings are for a maximum of 20 pax. For group bookings more than 20 pax, kindly email us for a quotation. - Online promotion deals are not fixed and may be subjected to change on a daily basis. - We reserve the right to turn away guests we deem unsuitable. Do note Booking fees with Hostelworld are non-refundable. - Please take note that our normal check-in time is at 2pm and check-out is before 12pm. Early check-in is subject to bed availability. *Although there was a small cupboard to keep our properties there was not any door latch for closing the cupboard. It was not logic to find a door latch and buy it by ourself because we do not have time. Time is valuable for us :) *The air conditioning place was quite dangereous that it was very close to one of the above bed. *The room was small for ten people.